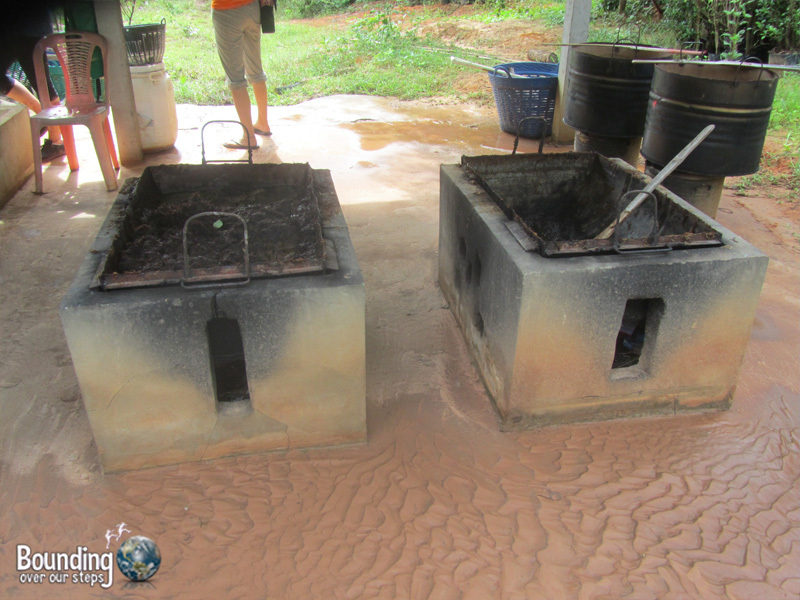 While in the village of Ta Klang in Thailand’s Surin Province, I came across a paper-making factory that taught me how to turn elephant poo into paper. Unfortunately, the poo is collected from captive elephants, usually chained to either a tree or post of some sort, standing with their poo racked and stacked to the side. Nevertheless, I was very interested in learning about the process of turning something often seen as valueless into souvenirs like memory books, picture frames and bookmarks. 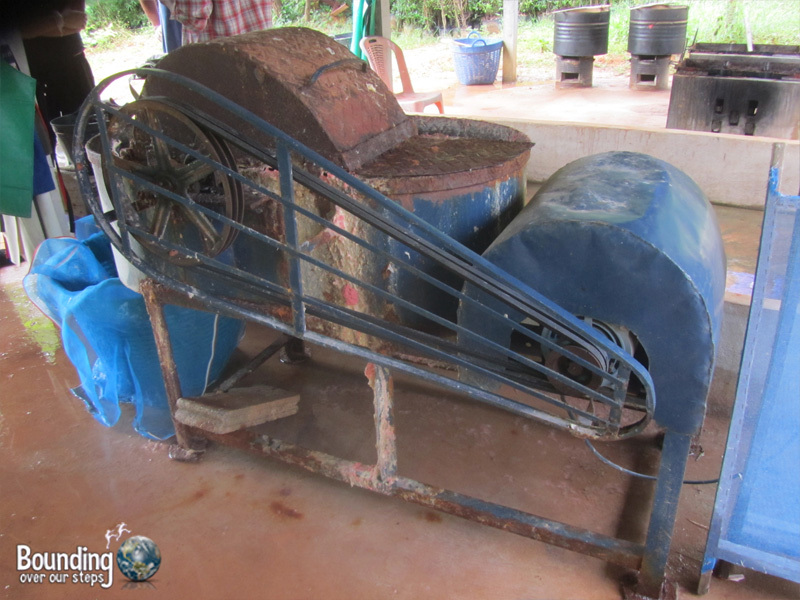 I was quite surprised to learn that the first step of turning poo into paper involved washing the poo. How does one go about cleaning something that is inherently dirty? 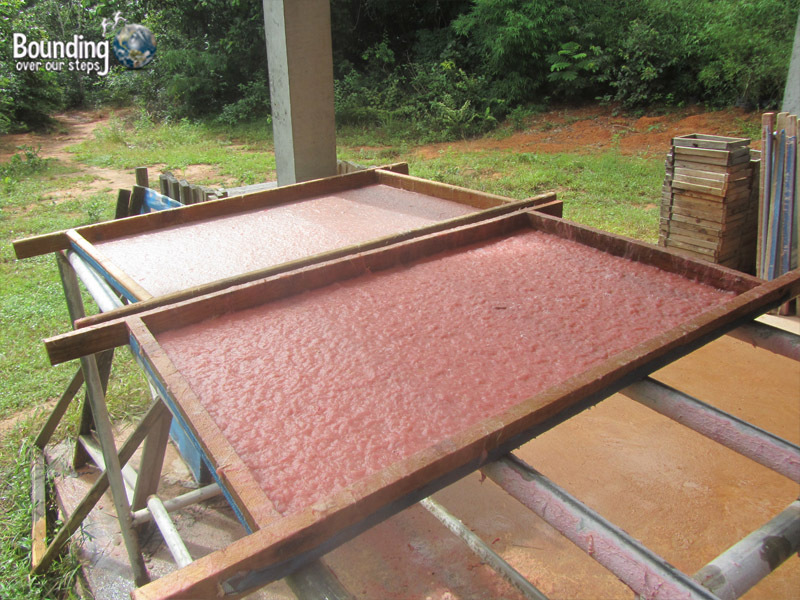 But elephant poo, as it turns out, is very fibrous and it is the fiber that actually gets turned into paper. So “washing the poo” really means removing the poo and using the remaining fiber. 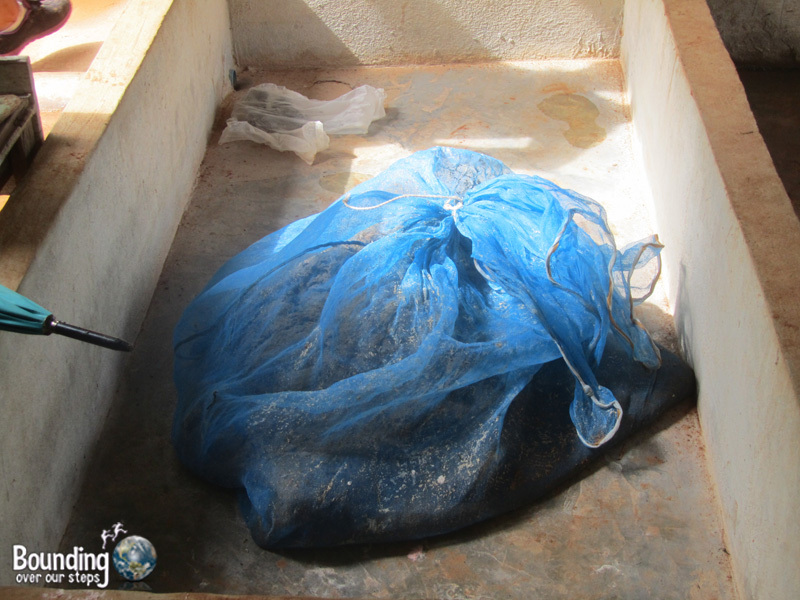 This is done by putting a large amount of elephant poo inside a mesh bag and tying it before hosing it off, leaving you with a bag full of fibrous material ready for the next step. The bag of fiber is emptied into big pots. Water and bleach are added and the mixture is slowly brought to a boil by fire. Once the fiber has been bleached and boiled the water is drained the leftover mixture gets added to one of the most interesting mixing machines I have ever seen. 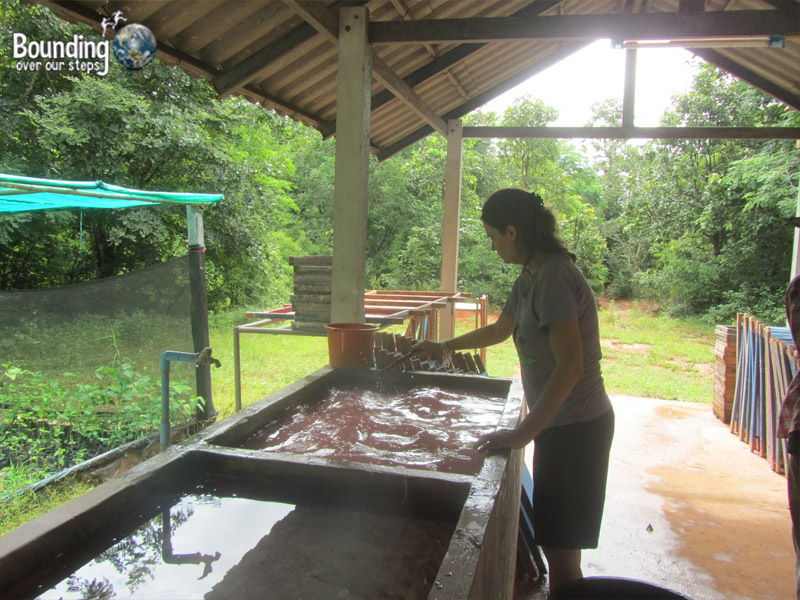 Bark from the “sah” tree, which is common in the north of Thailand, gets added to provide extra fiber and fabric softener is added to soften the entire mixture. Coloring can be added at this stage too. Everything gets mixed well before it is ready to move on to the next stage. 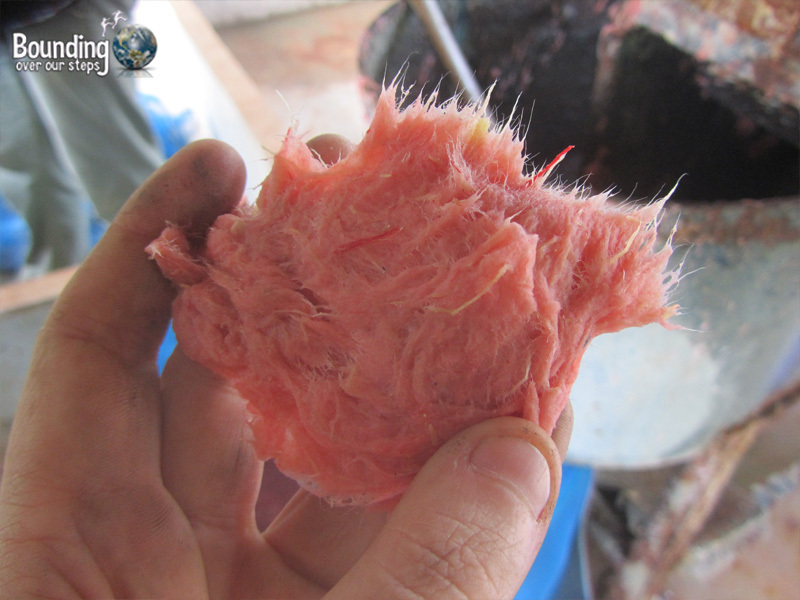 The soft pink fiber gets added to cold water and mixed with a wooden stick. Then comes the fun part: slip a porous tray, which looks like a small screen door, into the liquid and move it under the water from the back to the front allowing the fiber to settle on the tray. Slowly lift it out of the water letting all the water to drain and only the fiber to stay on the tray. The tray turned out to be heavier than I had thought. Be sure to put the tray on a drying rack in the sun. Depending on what time of year it is, namely is it the wet or dry season, your poo paper should take anywhere from 2-4 hours to dry. Please note that this process is not recommended for other animals such as dogs or cats. It works well with elephants simply due to the fibrous content of their diet. Can you think of any other animals whose poo might make good paper? Great article. Often wondered who poo was turned i to paper but didnt investigate it. So now i know… thank you. I love that its pink!